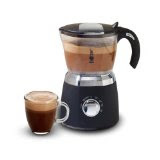 A cool gift idea for this Winter Season - the Bialetti Hot Chocolate Maker & Milk Frother . - Includes a 'Cool Mixing' function to froth milk without heating it for iced coffees or chai teas. The Bialetti Hot Chocolate Maker & Milk Frother produces incredibly rich and creamy cups of hot chocolate with very little effort!